On Friday, April 15th, John G O’ Dwyer, (author of the first guidebook to Ireland’s pilgrim paths ) will give an illustrated talk on Ireland’s newly launched Pilgrim Passport. The event will begin at 9.15pm on Friday April 15th in the Sneem Hotel, Sneem, Co Kerry. 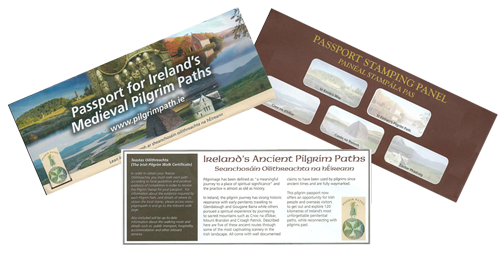 The passport offers an opportunity to walk 5 paths and receive a pilgrim stamp for each. The passport is then forwarded to Ballintubber Abbey to obtain a Teastas (Certificate of Completion) , for Ireland’s pilgrim paths. On the evening John will also talk about his own experience of walking the 5 pilgrim walks that must be completed to obtain the Teastas. The five paths are: St Kevin’s Way, Co Wicklow; Cnoc na dTobar and Cosáin na Naomh, Co Kerry; the Tochar, Co Mayo and St Finbarr’s Pilgrim Path, Co Cork.